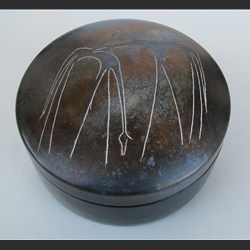 Hand-made smoke fired one-of-a-kind multi-purpose Box. Creating this work required several stages of production including bisque firing, and smoke firing under favorable weather conditions. See Primitive or Smoke Firing http://www.loondance.ca/m-4-lyse-fleury.aspx.